Casual local decor. Staff really friendly, couldn't do enough, always smiling faces!! Position of main hotel on the beach was stunning, especially at sunset, with fruit bats flying overhead!! Amazing and very relaxing hotel. My husband and I stayed at Savoy Resort and Spa as part of my birthday trip. It was amazing! The resort caters to all your needs and the staff is friendly and love their jobs. Wonderful breakfast everyday, fantastic drinks provided on the beach from the Geco Barr Thank you Abdelfatah, Richard, Nicky and Freddy and all the other staff for the wonderful service! We will definitely return..
Where to find Seychelles hotels near an airport? Where can I find hotels in Seychelles that are near tourist attractions? Where do Hollywood celebrities spend their honeymoons? They escape to the soft beaches of Seychelles. This enchanted archipelago offers lush stretches of jungle, hidden beaches, marine parks, and luxurious resorts. You’ll have 116 islands to explore on thrilling boat excursions. Travellers enjoy scuba diving, swimming, and fishing off the coasts of hidden islands. If you want to enjoy exotic fruits, giant tortoises, turquoise waves, and pure bliss off the coast of Africa, it’s time to get your hands on the lowest rates around at Seychelles hotels. Make your wildest dreams come true with cheap travel deals from Expedia. Mothers know best in Seychelles. The island enjoys a strong matriarchal culture that revolves around family, honesty, and hard work. Local music and cuisine are fusions of European and African customs. The main languages spoken on the island are Seychellois Creole, French, and English. 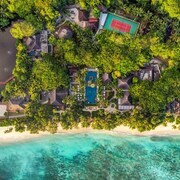 Celebrities, influential business people, and ordinary vacationers flock here to enjoy sweet anonymity in a landscape of dense forests and secluded beaches. If you hate taking a gamble with weather, you’ll love the fact that the temperature changes very little throughout the year in Seychelles. Expect to enjoy temperatures between 24 degrees Celsius and 30 degrees Celsius whatever time of year you come here for a holiday. The island’s position ensures that high winds are rare. You may experience heightened levels of humidity from December to April. Whether you’re sneaking away to escape the snow or bringing extra sunshine to your summer plans, you can count on hotels in Seychelles to offer you comfort and decadence. Do you have beaches on your brain? Prepare to find corals, turtles, and bliss at Petite Anse, Spiaggia Anse Soleil, and Baie Ternay Marine National Park on Mahe Island. While you’re still on the island, visit Victoria Market, the Seychelles Natural History Museum, and the Seychelles National Botanical Gardens. Anse Lazio, Anse Georgette, and Vallee de Mai Nature Reserve will satisfy your desires for fun and relaxation when you visit Praslin Island. All the wonders that wait for you at various islands near your Seychelles hotel can’t be contained in any single list. Begin planning your holiday today to squeeze more fun out of every day you spend in this lovely little corner of heaven. Why settle for ordinary accommodations when you can also enjoy renting a car in Seychelles for the guaranteed best rate around? 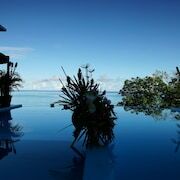 Plan an extraordinary holiday by choosing a Seychelles hotel to stay at right now. 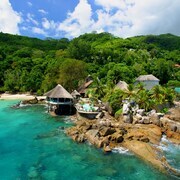 In addition to connecting you with amazing rates at top hotels, we’ll also help you enjoy cheap flights to Seychelles. Is it time to travel with style? Book a package to paradise using an all-inclusive vacation deal from Expedia.ca today. 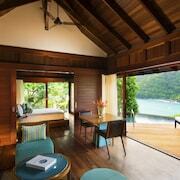 What are the most popular Seychelles hotels? Are there hotels in other cities near Seychelles? 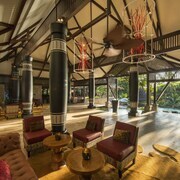 What other types of accommodations are available in Seychelles? Explore Seychelles with Expedia.ca’s Travel Guides to find the best flights, cars, holiday packages and more!